Residential locksmithing refers to all lock services performed at a home, apartment, condominium or any non-commercial location. One of the most frequent tasks we perform is handling any type of home lockout. No matter what time of the day or night, we are very fast to respond to your location. We take your safety and security very seriously to insure when we arrive at your location, you know the person you called is the person coming to provide your service. This is why I have pictures of myslef and our vehicle on every page. 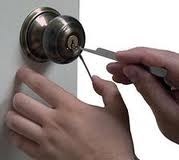 We also provide the following residential services at very affordable prices: Re-Keying your existing locks to a new set of keys, Installing New Knob (entry) Locks, Installing Deadbolt Locks, Install Mail Box Locks, Removing Broken Keys from locks, Replacing Lost or Stolen Keys, Bump Proofing your existing locks, Install or Re-Key Cabinet or Desk Locks, Install, Replace or Re-Key Patio Door Locks; just to name a few of the services we provide. Citrus Lock & Security is the leading lock-pick expert. Our high success rate will save you valuable time and money because that means, in most cases, the lock will not have to be drilled and you will not have to pay for a new lock! Many un-skilled or illegitimate Locksmiths try to up-sell expensive locks or even door knobs. We on the other hand, specialize in getting you back in your home as quickly and inexpensively as possible. We know how upsetting and frustrating it is when you are locked out of your home. At Citrus Lock & Security, we try to put you at ease, provide quality, fast service and make sure you only pay for the service you need. Most of the time, our customers will find their lost keys inside; but if not, we can make new keys to fit your existing locks; or worst case scenario, re-key the locks right there on the spot. There is no delay and, we perform this service 7 days a week, day or night. Many times, we discover that we have to fix broken or troublesome locks. Our first priority is to diagnose the problem and if at all posible, repair it. If we find the lock is too far gone to be repaired, then with your approval, we perform a lock replacement. We can then rekey the new lock to fit your existing keys; thus eliminating the need to carry a seperate key. Most times, it is very difficult to fix a lock if it is found the existing problem is anything other then a troublesome cylinder or just a badly worn down key. We specialize in lock replacement and have a large selection of both residential and commercial locksets in our vehicle. Thus, saving you valuable time and a trip to the store to purchase a new one. Citrus Lock & Security often assists with evictions by meeting with local Law Enforcement Officers at the property where the eviction is taking place. We will open the locks if access cannot otherwise be obtained and then we will either change the locks or re-key them if we are able so that the old keys will no longer work. We provide this service 24 Hours a day, 7 days a week and no advance appointment is necessary. Just let us know where and when and we will quickly respond. Upon request, we can also provide a lockbox on the front door which will then only permit authorized persons to gain access to the building after the home has been re-keyed and secured. Citrus Lock & Security frequently assists with Real-Estate Owned Properties. We will re-key locks if possible or replace the locks entirely if they have been damaged in any way over time. If requested, we can also provide a lockbox on the front door which will then only permit authorized persons to gain access to the building after the home has been secured. More then 50% of all residential break-ins occur through a first floor door. Less then 25% of all residential break-ins occur through a window. A thief's preferred method of entry is by quickly getting through an unlocked door. If the door is locked, their preferred method of entry is by using "BUMP KEYS"
The average residential break-in creates approximately $1,600 in losses. When you purchased your home, whether it is a re-sale or brand new, chances are very good you are NOT the only folks who have a key to your new home. This is especially true if it is a brand new, never lived in home. Statistics show, almost EVERY sub contractor who helped build your home has a key. This includes but is not limited to the Electrician, Plumber, Carpenter, Drywall Installers, Painters, Roofers, etc. ; the list goes on and, they ALL still have working keys to your home. It is VITAL you re-key the all the exterior locks to a new set of keys as soon as you can after you "close" on your home to insure your safety and security; BEFORE you move in. Let us ensure that you do not become a Statistic. Call Citrus Lock & Security at: (352) 445-3131 and we will be more then happy to assist you with all your security needs at the most reasonable, affordable price. While we are already at your location, we will be happy to advise you as to how best secure your home, apartment or condominium. We will survey your property, assess the risk points and advise on various lock options that are available to meet both your security needs as well as your budget. Normally, it should only take a few extra minutes and there are no extra charges for this service.